MEDALLION: Celadon color new jade hand carved medallion depicting two fish under the roof of their home protected by two dragons. 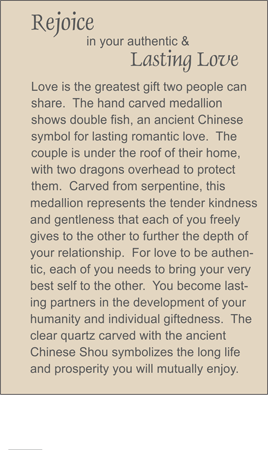 ACCENTS: Rock quartz beads etched with the ancient Chinese Shou symbol for long life and quartz ellipses. COMMENTS: This is for the couple who has proven their love is for forever.